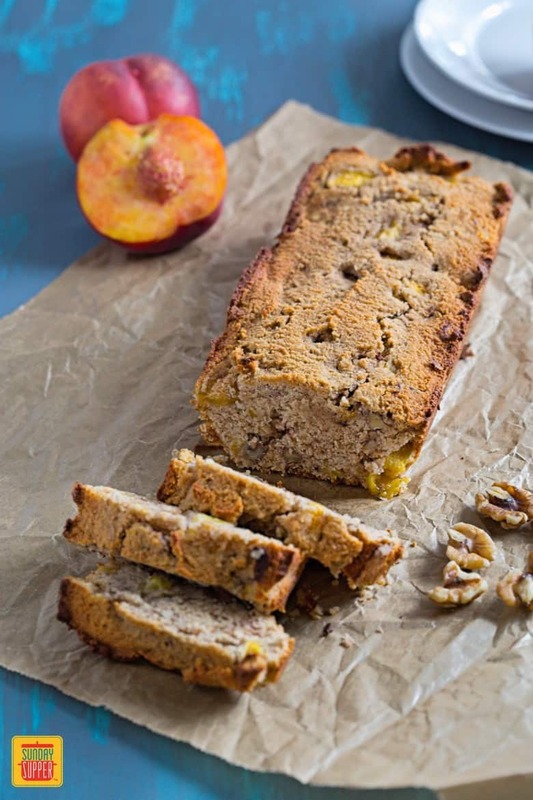 If you love peaches and want to eat them literally with every meal during the season, here is a great breakfast and dessert recipe: a Healthy Peach Bread with spelt flour and walnuts. It is not only delicious and flavorful but also contains a bunch of good ingredients. Peaches are juicy and tasty and they are also quite good in desserts. You can make a lot of sweet temptations with fresh or canned peaches. 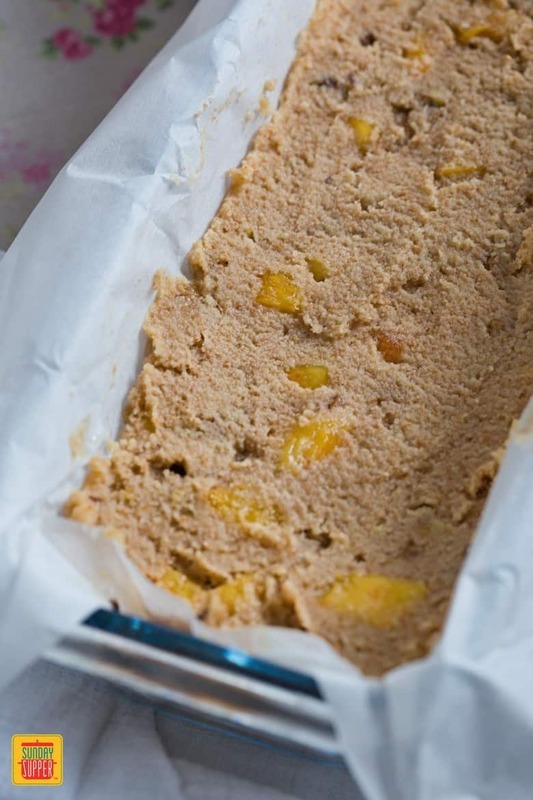 Our Healthy Peach Bread is great because you can enjoy it without feeling guilty. 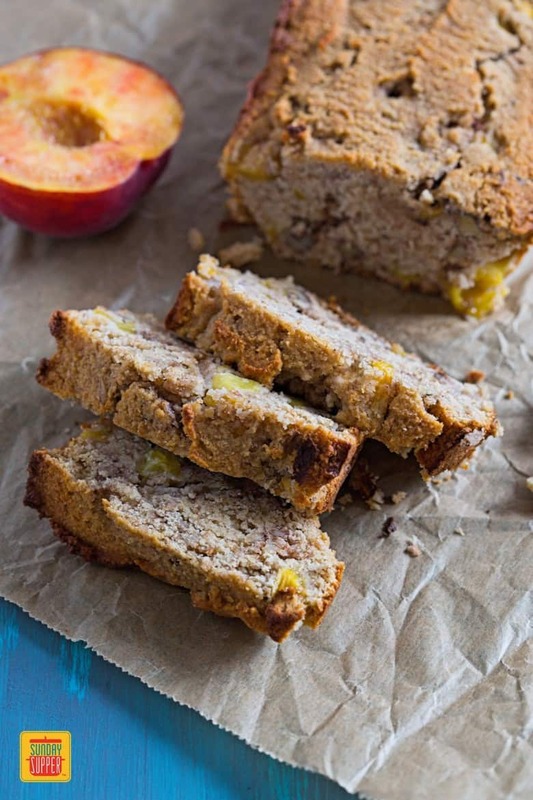 This Peach Bread contains a little bit of brown sugar and honey which are much better sweeteners for you than the white sugar as they contain some vitamins and minerals. The bread is also made with whole grain spelt flour and coconut flour – both healthier alternatives than all purpose wheat flour. The spelt flour has a distinctive sweet taste and creates baked products with a soft structure. Coconut flour also creates a light texture, hence this Peach Bread is quite tender and fluffy. Olive oil is among the best vegetable oils in terms of nutrition. Additionally, it can withstand higher oven temperatures: that’s why I don’t recommend substituting other oils in this recipe. 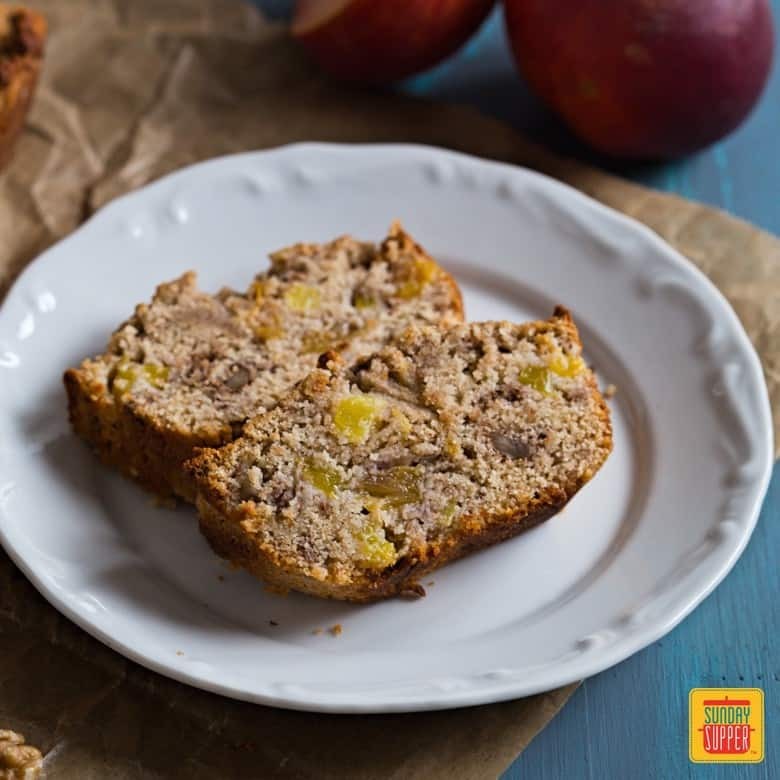 Last but not least, this Healthy Peach Bread contains walnuts which are full of minerals and healthy fats. 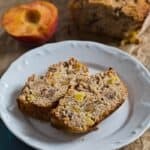 Healthy Peach Bread is not very sweet making it suitable for breakfast and good also for your kids. It is a great addition to the morning coffee or the afternoon tea. It is certainly one of the best peach breads you’ll try! You might be surprised to find out that this bread is quite easy to make. 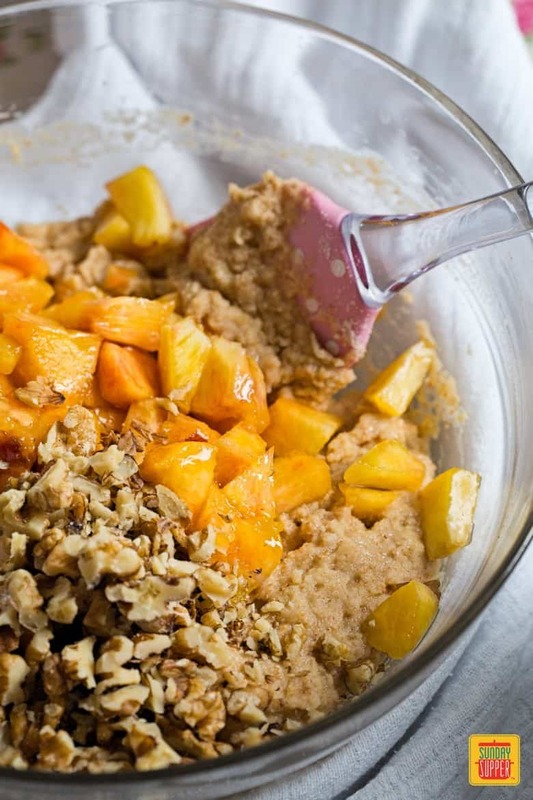 The recipe is pretty straightforward: beat the eggs with sugar and honey, add milk and vanilla, fold in dry ingredients and finally gently fold in chopped peaches and walnuts. After that you only need to bake the bread in the oven until golden brown. Enjoy warm or cold – it is equally tasty! 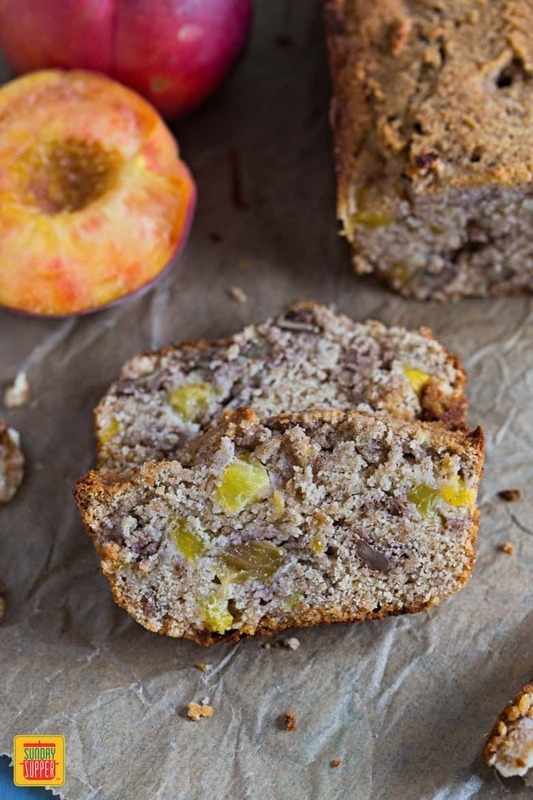 A Healthy Peach Bread with spelt flour and walnuts. It is not only delicious and flavorful but also contains a bunch of good ingredients. 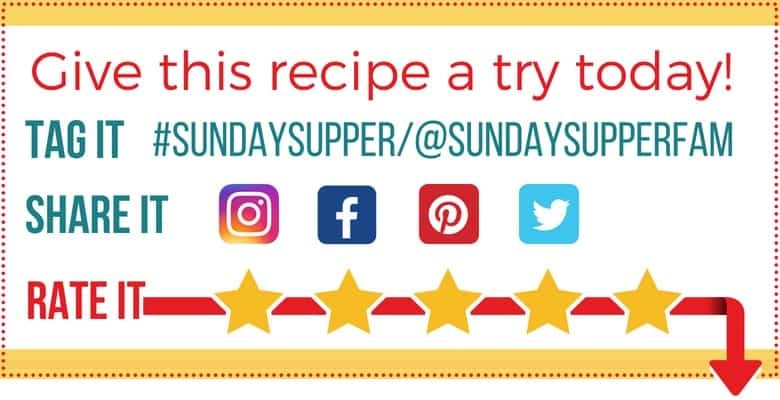 Preheat oven to 350 degrees F. Line a 8 x 4 (or 9 x 5) inch loaf pan with a sheet of parchment paper and grease it well (preferably with extra virgin olive oil). In a medium bowl combine coconut flour, spelt flour, baking powder and salt. Stir and set aside. 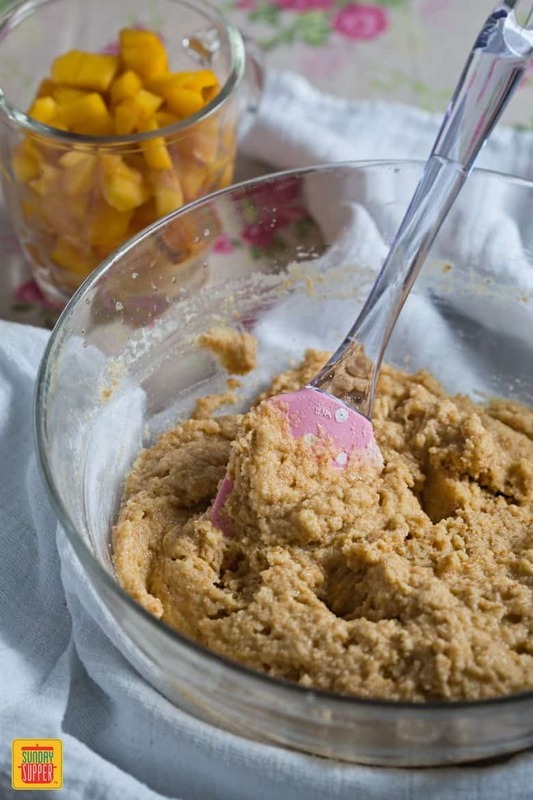 In a large mixing bowl, using an electric mixer beat eggs with honey and sugar for about 5 minutes, until the volume of the mixture doubles or triples. Add olive oil and vanilla and beat until absorbed. Add milk and beat just for few seconds. Using a rubber spatula gradually fold in the dry ingredients until completely absorbed. At the end fold in also the peaches and the walnuts, until evenly distributed in the batter. Transfer the batter to the prepared loaf pan. Bake about 45 minutes, or until a tester inserted in the centre of the loaf comes out clean and the top of the bread becomes golden brown. Let cool for 10-15 minutes before serving it. Keep leftovers in the fridge for 2-3 days. There shouldn’t be much difference using sprouted spelt flour, but it won’t absorb as much liquid. If the consistency of the batter seems a bit runny, a bit more flour could be added at the end (1 to 2 Tbsps). Hope it helps! Let us know what you think!